ColPaC - 3 x 11"
ColPaC - 11 x 21"
ColPaC - 7.5 x 11"
ColPaC - 5.5 x 7.5"
/ Hot & Cold Therapy / ColPaC - 23"
Customers buy these products with the ColPaC - 11 x 21"
Delivers up to 30 minutes of soothing relief from acute pain, swelling and fever. Filled with a non-toxic silica gel that remains pliable throughout treatment. Sturdy. Easy To Use. Effective. Good Value. Athletic. Average Health. Value Oriented. The ColPac is a great product which is long enough to wrap around my knee. I would recommend the ColPac to anyone who requires cold therapy. There is a problem however with the shipping options which appear to be deceptive. Because I really wanting the product, paid for what I thought was expedite shipping (only option provided at checkout) but got ground shipping (which was noted as being not available to Hawaii in the shipping options) at the expedite shipping price instead. Was advise by customer serice that customers in Hawaii are charged for expedite shipping although items are shipped Fedex ground. Upon check-out my invoice reflect expedite shipping not ground. I am very happy with the product, but not with the misleading shipping policies noted on your website. Recommend your website be corrected to accurately reflect shipping options to Hawaii. I don't mind paying a higher shipping cost to get a product I want, just don't like the surprise of not getting what I though I was paying for. Lightweight. Easy Storage. Sturdy. Safe. Easy To Use. Effective. Flexible. 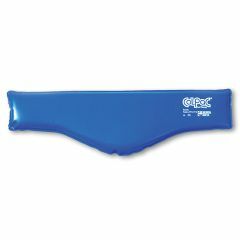 I love this flexible colpac which can cover wide area of the body , before that i had very rigid cold pac and was only helpful for the lower back. Lightweight. Easy Storage. Sturdy. Safe. Easy To Use. Effective. Good Value. I had a hip replacement surgery and use this particular cold pack on my groin which wraps around to my incision on my hip. It has been a life saver! I am so happy I found this product. I also received it in 2 days of ordering! Great job! Using this after physical therapy is great because it wraps around my ankle perfectly. Lightweight. Easy Storage. Sturdy. Safe. Easy To Use. Effective. Good Smell. Good Value. Every thing it has is perfect. There is only one addition I would like to see. Perhaps Velcro or some sort of ties in the front so I do not need to hold it closed at the front of my neck. I just put my order in yesterday and it arrived by UPS today. I'm really impressed, especially at this time of year. I will definitely keep ordering from a company that delivers in a timely fashion. Keep up the good work. I will tell my family and friends about your excellent service. Thanks again.